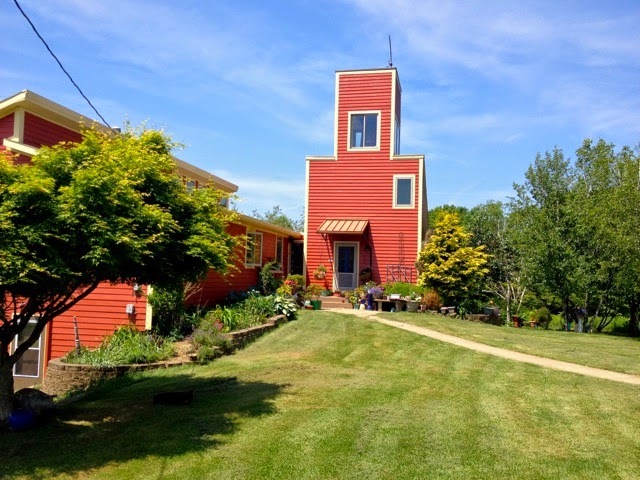 It's a thing, going from a grayish green house to a bright barn-red house. 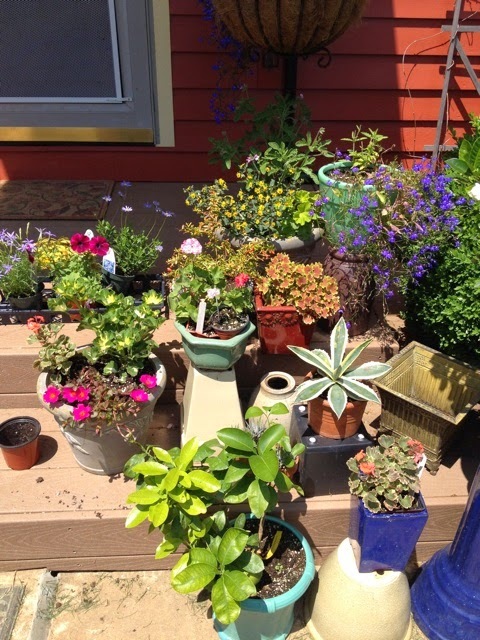 I never thought much about what color flowers I'd put up against the old dull siding. I really have to think about what I'm using this year, and I'm loving every minute of it. The old gray siding is still on the garage. Sigh. We ran out of money. I can't believe our house was ever this color. But I picked it. It seemed safe. Yawn. 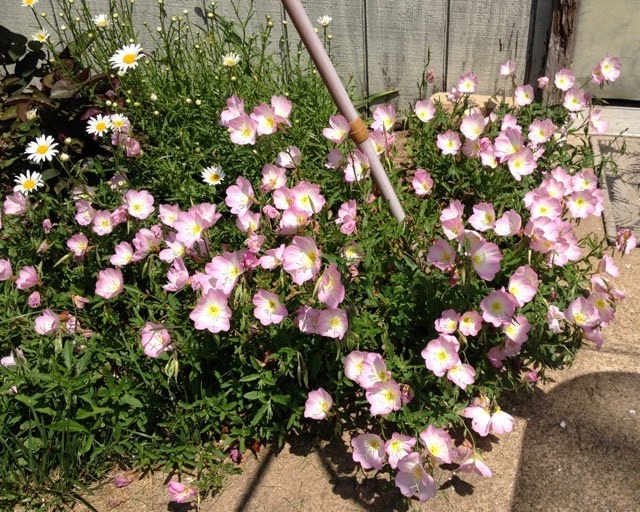 Our friend and my hero Marilyn Ortt gave me a start of her Missouri primrose about 22 years ago as a housewarming gift. It's never been more beautiful than this spring, the spring when we lost her. She did more for Marietta than almost anyone I can think of. Started and maintained our recycling program way back before it was cool. Served on the Tree Commission. Started, with my MIL Elsa Thompson, the Marietta Natural History Society. Fought for open spaces and nature preserves and clean air and water...she was amazing. I think of her every time I look at these primroses. Treasured plants are like that. You remember the people who gave them to you. They say that redheads shouldn't wear pink. Hmm. I disagree. 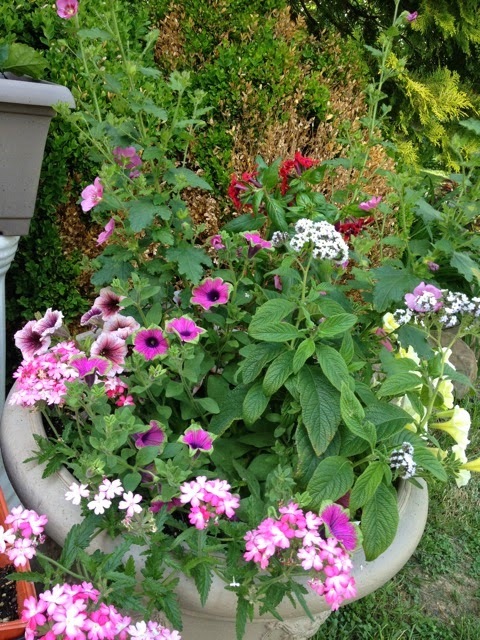 I'm diggin' this magenta and green petunia, with white heliotrope, pink Cape mallow, red Cuphea, pink verbena, and yellow and rose-throated petunias. I don't put pink right up against the siding, but it's fine a ways out. 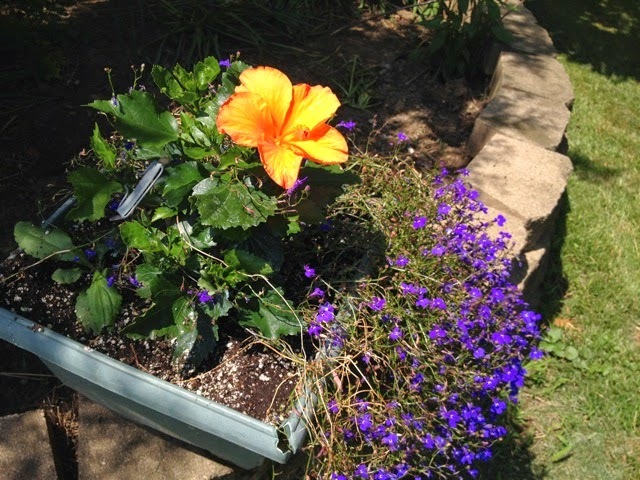 I ventured a little red in geranium "Wilhelm Langguth," then swung over to my favorite petunia, "Papaya." I think it looks fine against the siding. Maybe not the red geranium. Still tinkering. A better shot, in shade. 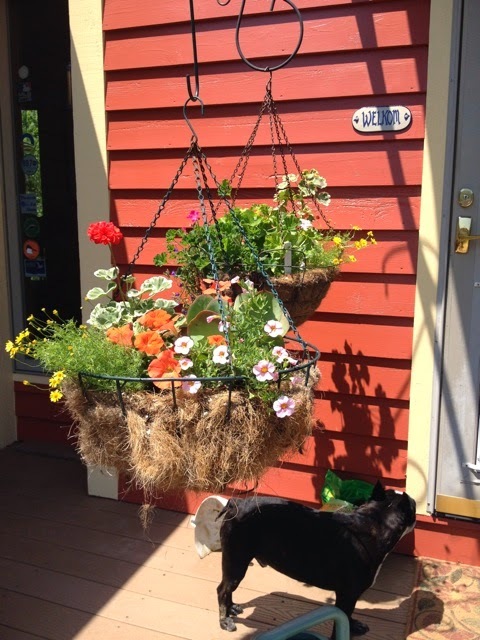 An astute observer will note Kalanchoe or Paddle Plant "Fantastic" in the rear basket. I love those things. 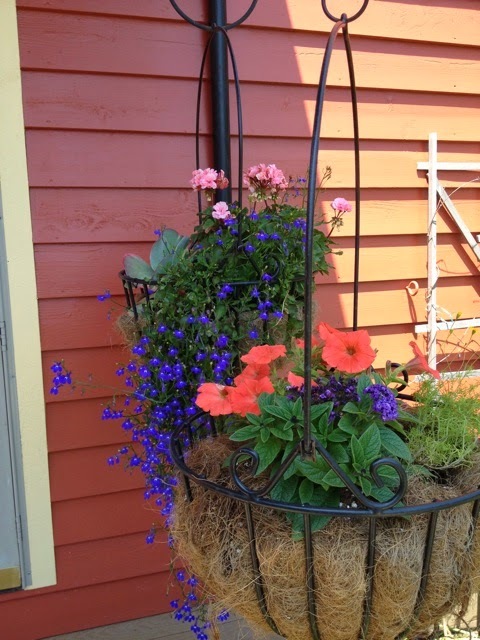 Cobalt blue, as in my beloved lobelias, is the PERFECT accent color for barn red. Yum!! 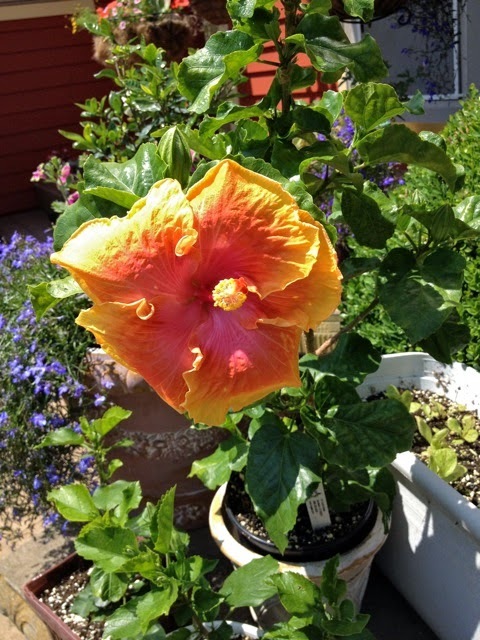 Here's my favorite tangerine hibiscus, frozen to the soil, representing with her first blossom since November 23, 2013. It took a LONG time for her to pick herself up by her bootstraps and send up some shoots. Man, that was a long wait. But she's coming back at last. Her two cutting kids are, too. TA-DAAAAA!! That's a six-inch blossom there. I like big buds and I cannot lie. Not only that, but each one lasts two entire days! 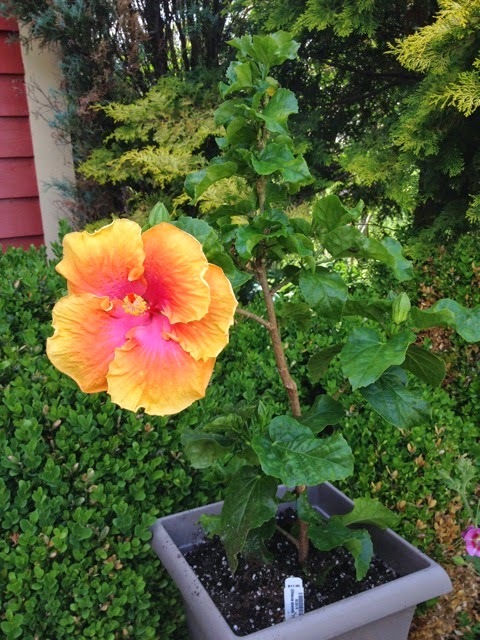 I've never had a hibiscus last more than one day in warm weather. She's extrasexyspecial. That pink throat kills me. 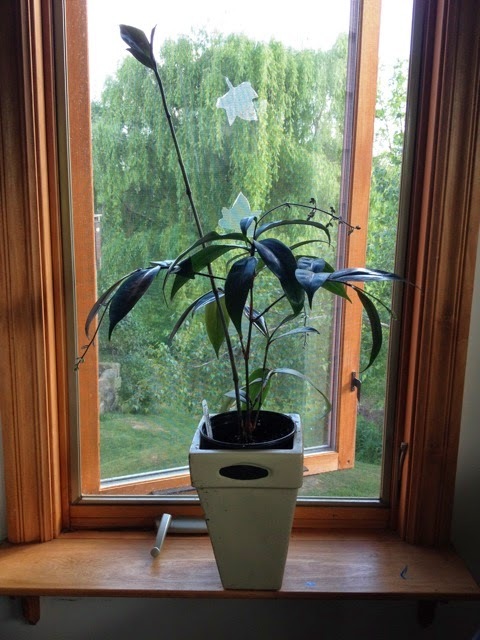 Everything about this plant kills me. She tried to die three whole times in the greenhouse--hated the cold nights. But she hung in there and so did I. She doesn't much like winter, but loves summer. Hey, me too. A bit of a plant collector...a crazy monkey plant collector. Lori, there's the beautiful variegated agave you sent me! And the Ruby Red grapefruit tree is in the bottom blue pot. The two grapefruits it's bearing are the size of navel oranges now!! Phoebe has threatened me with harm if I dare eat one without her. Maybe Christmas break they'll be ready? I don't know how long it takes. Anyone? Months? A year? They set fruit sometime in February. 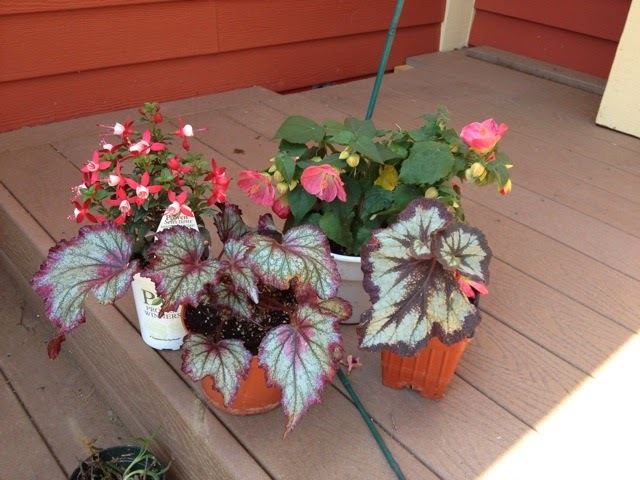 Another planter in the making, with Fuchsia "Betty," Abutilon "Blushing Belle" and Rex begonias "Ring of Fire" and "China Curl." Very pretty combo. If I have one complaint about the abutilon, it's that it makes too darn many flowers. Imagine that. But really, it gets in the way of its growth pattern! Weighed down by its own blossoms. Logee's. This one is a bit overbred, if you ask me. A new discovery for me, also from Logee's, is a tropical spiderwort (Dichorisandra pendula) they call "Weeping Blue Ginger." Well, it's not a ginger, but I adore the growth habit. So very elegant and Oriental. It's covered in blue three-petaled buds that are taking their own sweet time opening. I just dig the shiny dark green leaves and its angular habit. It's going to be awesome when it blooms. I think this is going to be a huge plant. Already two feet tall and reaching for the stars. 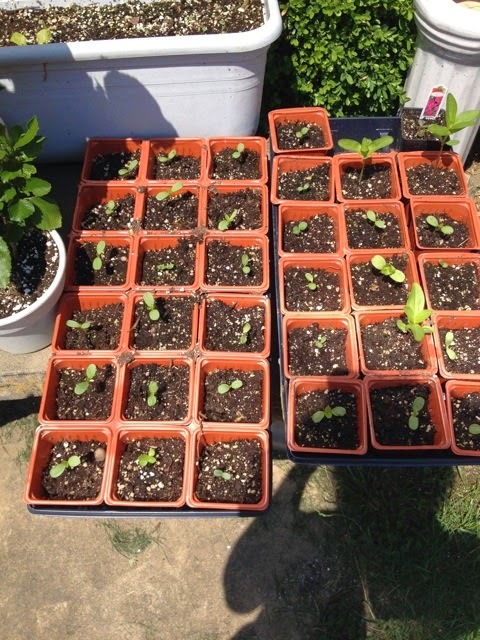 Phoebe has developed a penchant for cutting flowers, so I'm planting 40 Blue Point florist's zinnia plants for her. Our little nascent cutting garden, soon to be set out in the beds. I lost so many perennials to cold (ALL of my beautiful cardinal flower that the hummingbirds loved so much) that I'm going to have to fill in a lot of holes with zinnias, which they also love. Must look for some good cardinalflower. I will miss it so in July. The view out the kitchen window. Garden Weasel paradise. Adore my mini Phalaenopsis and Doritaenopsis orchids inside on the windowsill. If you wonder why so many are in pots, it's because the rabbits eat pretty much every annual I try to plant in the ground. They leave most of my perennials alone, though they devoured my creeping phlox and Virginia bluebells this year, dammit! They'll reduce a geranium to a pile of leaves overnight. Eat it to the ground. Lobelias, same deal. Impatiens, forget it. We have a LOT of rabbits. Chet, get on that. Little dude goes on bunneh and chipmunk runs about a dozen times a day. No effect. 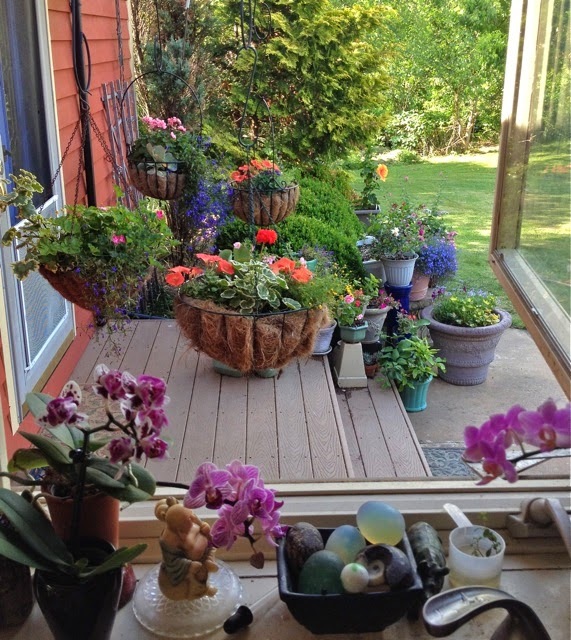 Yep, looks like somebody lives here, somebody who, after the worst winter ever, can't get enough flowers, sunlight, color and June. I'll get down and waller there! Being Iowa born, he generally didn't have much good to say about Hoosiers, but he loved JWR's poetry. Me, too. The poetry. Got no beef with Hoosiers. And here's me letting the weeding go for another week... Thanks for the inspiration! Place looks great. Belated congratulations too on first child preparing for all that comes next and second child not far behind. Impressive every which way if not untinged with a sense of parental loss. 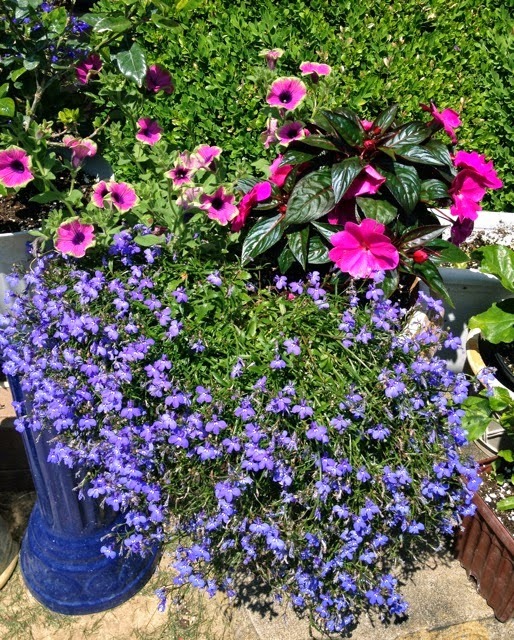 I couldn't resist the magenta and green petunia either! I have 3 in a big pot and it makes me smile in all its craziness--it is growing every which way. Love this post! Love garden pictures. So pretty. Your Grapefruits will be ready around around September/October. Takes about as long to ripen a citrus fruit as to gestate a baby. Those little pure blue three petal wild flowers are blooming in the woods on the east side of our cabin. I love how they come and quietly present themselves unawares. My mother and I are big JWR fans too. I recited Going Back to Rigsby Station for my speech class in High Schoo. New Matamoras style. I have some white lobelia that I'm loving this spring. It really sets off the more colorful flowers.